Slikok Creek is a tributary to the Kenai River. It is a nursery supporting several thousand early run Chinook, Coho and Sockeye spawning and rearing habitat. The confluence of Slikok Creek and the Kenai River is located near the Kenai Peninsula College, approximately 19 river miles upstream from the mouth at Cook Inlet. The creek begins as the outflow from Nordic Lake on the Kenai National Wildlife Refuge and provides many miles of spawning and rearing habitat for chinook, coho, and sockeye salmon. This habitat is classified as essential fish habitat by the National Marine Fisheries Service (NMFS). The creek is a low gradient, meandering creek. 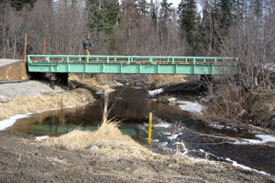 The stream has four road crossings: College Loop Road, Kalifornsky Beach Road, Sterling Hwy. and A.R.C. Loop Road. These road crossings were evaluated by the Alaska Department of Fish and Game (ADF&G) in their 2000 effort to assess passage of juvenile salmonids. According to the ADF&G study, three of the four crossings act as barriers to upstream migrations, the worst being College Loop Road. In the summer of 2003 and 2004 the Kenai Watershed Forum (KWF) more closely evaluated each of the three problem road crossings. It was clear that the College Loop Road presented the greatest potential to block juvenile anadromous fish. It is the furthest downstream, thus blocking the largest amount of habitat. It also created the most obvious deviation from the natural channel conditions. The crossing consisted of two culverts, one to pass the channelized flow through the road prism with a secondary overflow culvert for flood stage waters. Both culverts were improperly sized and placed to mimic the natural conditions present in the stream. Because of the importance of this delicate nursery to the health of the early run chinook salmon run, we replaced the improperly sized culvert with a new much larger culvert that properly fits the natural conditions of the stream. In the early fall of 2005, several hundred adult salmon returning to spawn were blocked by the culvert. KWF removed the culvert and replaced it with a bridge in Spring 2007.